Customer experience: what about real service? Globally, only 4% of Customer file an “official” complaint and yes, the rest 96% find word-of-mouth, social media and rumour-spreading more natural to ‘rate’ the inefficient service. A bored-to-death shoe seller? The bank clerks? An insurance advisor in haste? The ‘tough’ taverna owner not looking to serve? We all been there, getting some mediocre service, right? Everybody talks on Customer experience (CX). Another digital ‘hype’. True, we need more fine-tuned experiences in the online economy. But the reality, deep-down, is the Customer-centricity of companies. The value of a smile, a welcome, a node for pleasure is so precious… In most companies I’ve done service business within the last years, they have had reactive Customer service. They wait until something is broken. Few are measuring Customer satisfaction (only multinationals in B2B). It’s not in the culture! They leave it up to the annoyed customer to go to the trouble of searching and finding the management, fill-in some contact form or stand in queues, and leave a review, make a complaint. Perhaps we ought to spend more time being proactive. Customers in B2B2C advocate better service for themselves until companies finally manage to make things average enough (they rarely make things better than the Customer hoped). Brands often talk about being customer-centric but in reality, most businesses are still not set up with Customers at their core. Imagine, that even software as a s service companies, online platforms and services (where you buy their stuff on the cloud) aren’t exactly Customer-centric. Their search, support tickets, knowledge base and representatives aren’t the best. I have a lot of examples from Microsoft, Envato, Hosting services and many more. A UK survey (the Research conducted by Marketing Week in partnership with MiQ earlier this year) showed that while 42.4% of marketers think their organization should be structured around the Customer, currently just 5.8% of business are actually set up this way!!! Most Marketing departments are either product-centric or structured around marketing disciplines’ routine. I must have seen thousands of Product Marketers not having on their excel spreadsheet any Customer metric/indication. They produce communication activities, offers and sales promo (e-)coupons in volume, but not working on guaranteeing policies for the Customer. Customer service means showing the customer how important he or she is to you and the business by interacting with he or she, in a friendly- helpful and positive way. In every touchpoint. At the received incoming call. On the e-shop’s landing page. Good customer service means meeting expectations- but excellent customer service means exceeding them. Is there any more effective way to engage with customers than to create products that don’t break their hearts? So, what is your company’s primary focus? What is your honest reply? Many sincerely believe that they are customer-centric or focused on the customers they serve—when, in fact, they aren’t at all. Once you understand what a customer-centric company looks like, you will be better equipped to formulate a truthful answer. If you work at Amazon, stop reading here. The Ritz-Carlton’s service policies are so legendary, stories of satisfied customers have even made it into books – like this one. In it, customer experience expert and author John DiJulius describe the story of his stay at a Ritz-Carlton hotel — when he unknowingly left something behind in his guest room. Lily Robinson (who insists that she is three and a half years old) was quite confused by one of Sainsbury’s products called tiger bread. In her eyes, the bread didn’t resemble a tiger at all, and in fact looked very much like a giraffe. Lily Robinson (who insists that she is three and a half years old) was quite confused by one of Sainsbury’s products called tiger bread. In her eyes, the bread didn’t resemble a tiger at all, and in fact looked very much like a giraffe. To her surprise, customer support wrote back to her and explained the origins of the name: “I think renaming tiger bread giraffe bread is a brilliant idea — it looks much more like the blotches on a giraffe than the stripes on a tiger, doesn’t it? It is called tiger bread because the first baker who made it a loooong time ago thought it looked stripey like a tiger. Maybe they were a bit silly.” Lily’s mom enjoyed the letters and ended up posting them on her blog. Before long, this cute correspondence was a viral hit, and the pressure was on for Sainsbury’s to change the name of the product to the much more appropriate giraffe bread. As the Customers handle more of the simple issues themselves, frontline service reps get increasingly tough ones—the issues customers can’t solve on their own. And today’s reps are struggling with these complex problems. A friend in the retail industry admitted: “Our contact centre is like a factory of sadness.” They can’t cover on the thousands of demanded solutions or product/warranty/return/price/fault policies. No1. Introduce an officer who’s looking after Customer systems, policies, satisfaction – let’s call this a Chief Customer Officer. Must have the liberty to over-cross all departments (retail staff, call centres, marketing and product teams). No2. Audit where you are with Customer satisfaction and put this metric into every year’s improvement plan. Fix both perception level and practical side of services. Revisit sales pitches, scripts, warranties, deliveries and anything that is reaching the Customer doorstep. No3. Add action-paths and ‘tools’ on your website, e-mail newsletter, and physical store to check constantly on Customers and keep statistics as a database. No4. Agencies, lawyers, insurance, banking, telco, supermarkets: train like hell the people that interact with Customers at any level. They must not only deliver the company/product story but create affinity and real sentiment on the Customer views. How do you create real sentiment with Customer? They know, feel, and act exactly like the Customer thinks and feels. Any product, packaging, offer, price, service and employees stand on the Customers’ perspective. They are trustworthy with excellent Customer support, service and problems that arise. From a broken watch, up to a transaction, such companies turn everything to a positive experience, saving time and money to their Customer. The “don’t worry, we XYZ do this” is a natural thing. They are offering personalized service, from a wine producer who tags your wine up to the e-Services (Amazon, Software, payment companies and other retailers) who know so much about you (as behaviour and path of the funnel). They talk and act for Customer service. It’s in the behaviour, mindset, and their objectives and every colleague play a vital role in turning an abstract philosophy into a concrete reality. Globally, only 4% of Customer file an “official” complaint and yes, the rest 96% find word-of-mouth, social media and rumour-spreading more natural to ‘rate’ the inefficient service. So, does your company provide the expected interactions, transactions, services, content, functionality and necessary speed to satisfy your Customers and turn them into Brand Ambassadors? They are your reason for success—give them the attention they deserve! Hopefully, you find all the above helpful. 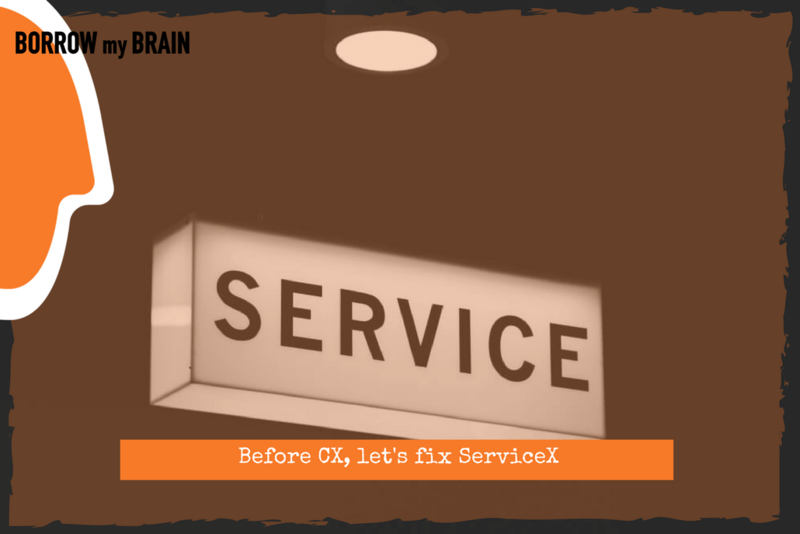 If you want more, feel free to contact us at Borrow My Brain, leave us a comment, or ask us how to plan a Customer-disruption-focus workshop to improve your efforts on this very critical field.